There are approximately five different major minimal pair applications on the market today, so I was excited when SLP Tech Tools allowed me to review their Minimal Pairs application to see how it was different from the others. 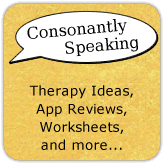 You can work on eight different phonological patterns in three different therapy activities to provide an enhanced therapy session for your clients. Continue reading for more information on what is involved in this application and for your chance to win a copy! On the first page you will see, it will have a list of clients. To add a client, press the "+" button in the upper right hand corner of the application. Then, enter the persons' name and grade and press "Save". His or her name will then appear on the list. If you would like to delete a client, you must press the "Edit" button on the "Client" screen and then press the red circle and delete buttons next to the users' name. Press the "Help" button at the bottom of the application to learn how to use the application. You must have an internet connection to view this page. You can also send an e-mail to SLP Tech Tools by pressing the notepad with a pencil button on the top right hand side of the page (you must have your e-mail connected with the "Mail" application on the iPad to use this). Select a client to play the application by pressing on his or her name. This will bring you to a screen where you can edit the students' information, view a history of sessions completed and data associated with the sessions, and settings. Arrow buttons on the application will move between the words, square buttons will move between the different types of sessions, and the "End" button will end the current session. Show Word With Picture? - You can toggle this option on or off to decide whether to show a written word beneath the image of a word. Randomly Shuffle Minimal Pairs? - You can toggle this button on or off to decide whether or not the cards are shuffled and presented randomly. Once you have chosen a student, you will see sessions in the "History" box if he or she has played the application before. Press on a session date to view more information about the session. This will show a number of correct and incorrect responses as well as a percentage of accuracy. If session notes were taken, they will appear as well. Information on the type of session played, date, and time will also appear. 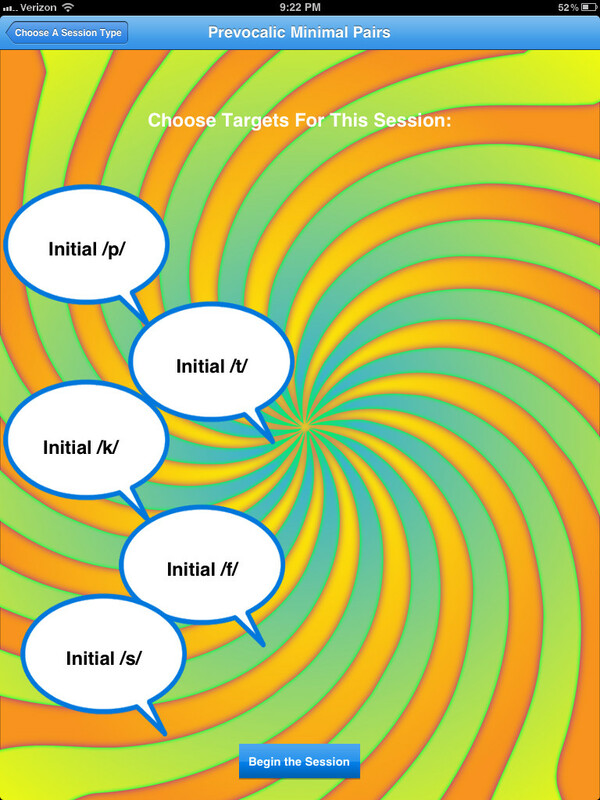 Auditory Training - This allows the speech-language pathologist to present a target word and the corresponding substitute to provide auditory awareness of targets and errors. You can record the words by pressing the circle record button and play the words by pressing the triangular play button. Press the green check mark if the student was correct or the red "x" button if he or she was incorrect. Contrast Drill - The narrator states the target word and an image will show. 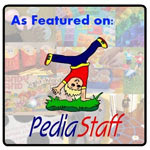 If the child produces the word incorrectly, the speech-language pathologist should change the stimulus picture to the contrasting word picture by pressing the yellow arrows in a circle button. You can press the sound wave button to hear the word presented again. This can also be used for auditory bombardment. Press the green check mark if the student was correct or the red "x" button if he or she was incorrect. 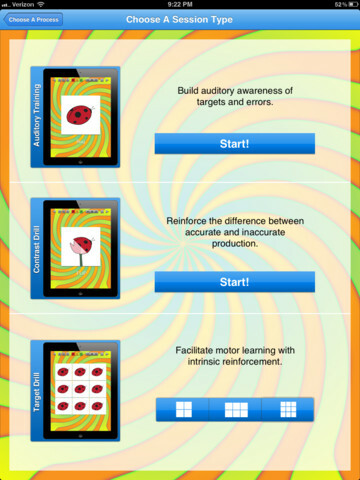 Target Drill - This activity provides repetition of target productions. You can choose how many cards to include in the activity (4, 6, or 8). Press the green check mark if the student was correct or the red "x" button if he or she was incorrect. A star will appear on an image if it is stated correctly, otherwise it will be faded if incorrect. Then, move on to the next word. Choose which sounds to work on during the session associated with the type of phonological process. For example, if you are working on the "Fronting" session activity, you can choose between initial /k/, initial /g/, final /k/, and final /g/ words to practice. Then, a word list will appear and you can choose which words you would like to show on the list via a check mark or press them to un-check and remove them from the current session play. Then click "Begin the Session" button to begin application play. Once all of the cards have been completed in a session or you press the "End" button to end the session, a "Final Session Summary" report will appear with the total amount of words produced correctly and incorrectly as well as a percentage for each. Then, you can type session notes in the box below. E-mail the report to yourself by pressing the "Share" button at the top right hand side of the screen and a text based report will be filled into the e-mail. Otherwise, press "Done Viewing Report". There are three different ways to work on minimal pair related activities and eight different phonological processes available to work on! Reports are created within application play so that the speech-language pathologist has one less thing to worry about. There are options for audio to hear the different words stated aloud for auditory bombardment. The images are clear and easy to understand. I would prefer to have the "Help" within the application in case I am not connected to the internet and need to read it. 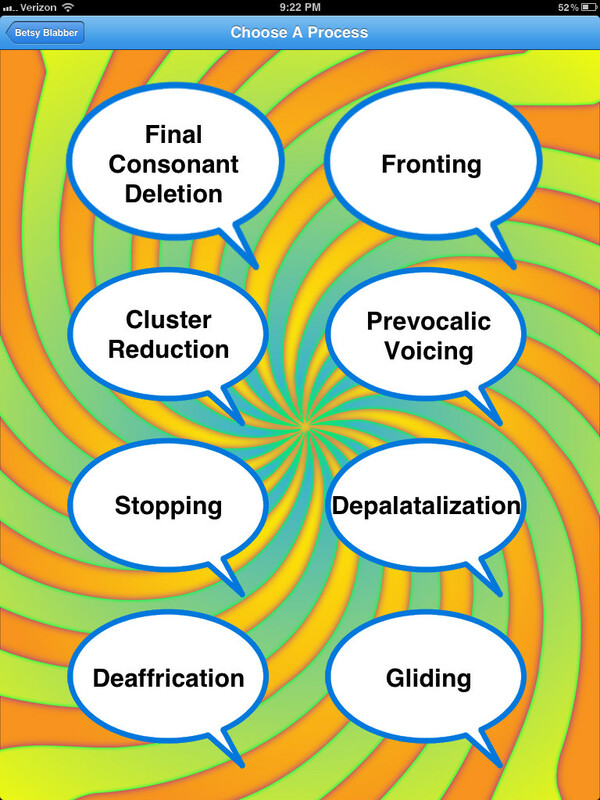 It would be great to see some more phonological processes come out such as Denasalization or Devoicing. 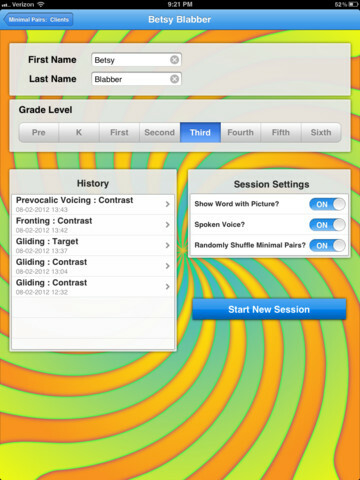 Phonological Processes: Have students work on various phonological processes on the application. Articulation: Find a phonological process in which the student would work on his or her speech sound and have him or her practice the words on the word list. Have the students place the words in a sentence. Make sure to show articulatory placement through a visual cue. Auditory Bombardment: Press the microphone button to hear the words and have children listen to the difference between the two. Receptive Language: Have students describe the different images and compare/contrast the minimal pairs vocabulary. Expressive Language: Have students write a sentence about one of the words on the application. Memory: See if students can remember the paired word on the other side of the card. 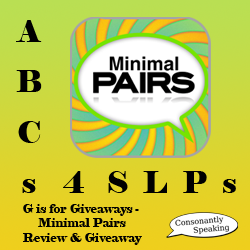 The full version of Minimal Pairs is $29.99 for the iPad. You can try the Lite version for free on the iPad before purchasing the full version too! Consonantly Speaking was given a code to give away with this review. No other form of compensation was given. Enter below for your chance to win a copy of this application!